The Blue Toon made it through to the Division One play-off final against Stenhousemuir with a convincing victory at Balmoor Stadium. 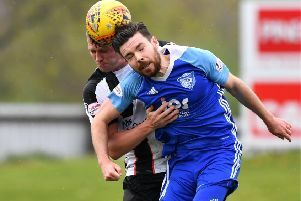 Peterhead went into this play-off semi-final with a slender one goal advantage but started as firm favourites on the back of seven consecutive victories. Roared on by a vociferous travelling support it was Stirling who broke forward in the second minute with Ross Kavanagh earning a corner although it might have been even better had he opted to shoot earlier. Moments later Darren Smith had a header saved by home keeper Greg Fleming who stood tall to block. With a swirling wind making conditions tricky it was Albion who continued to look the more intent to break the deadlock and an 18th-minute drive from distance by full back Ross McGeachie wasn’t far away. A minute later at the other end Willie Gibson slipped the ball inside to Rory McAllister but his shot was bravely blocked then the same player turned and shot at Binnie on the half hour. Five minutes later Binnie pulled off a superb one-handed save to deny Scott Brown. Then on 39 minutes the deadlock was broken. A Gibson corner on the right and a superb glided header by Mason Robertson went into the top left corner to add to his goal in midweek. The second half began with Peterhead on the offensive earning early corner kicks but they could have let Albion back into the game after failing to clear and a Peter Macdonald shot was held by Fleming. It was tie over in the 57th minute though. Scott Brown could have shot from the edge of the area but opted to slip the ball into the left side of the area to ace marksman Rory McAllister who picked his spot well to score. The Blue Toon then turned on the style and scored a neat third after 65 minutes. An Aidan McIllduff free kick on the right was blocked but played back to him and his low cross delivered with pace from the byeline was side-footed over the line from point blank range by Jason Brown to complete the scoring for the day.